Congrats to Danny Ching for muscling his way through this one and to Annabel Anderson for coming out on top despite a huge push from Jenny and Lina. Danny has now won this event three years in a row while Annabel has now gone back to back. 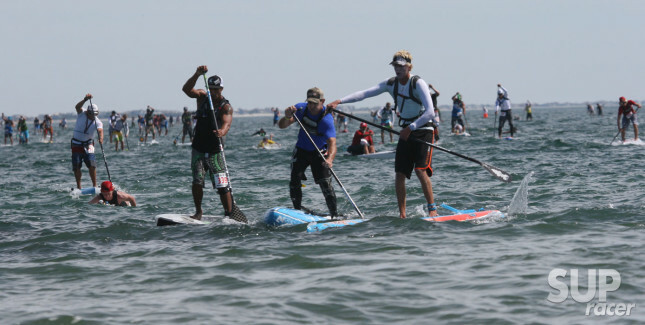 But they were just two of the stars: If anyone in the U.S. SUP scene didn’t know who Georges Cronsteadt was before today, they certainly do now. The Tahitian powerhouse is an absolute machine. Raging bull. 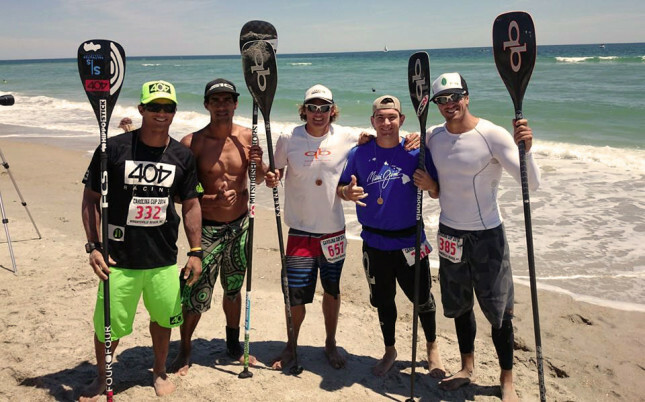 Travis was up there as predicted – probably could have won if the wind stuck around and the final few miles were downwind. Chase Kosterlitz in 4th after having a shocker of a start was impressive. Jamie Mitchell is returning to form. Solid. 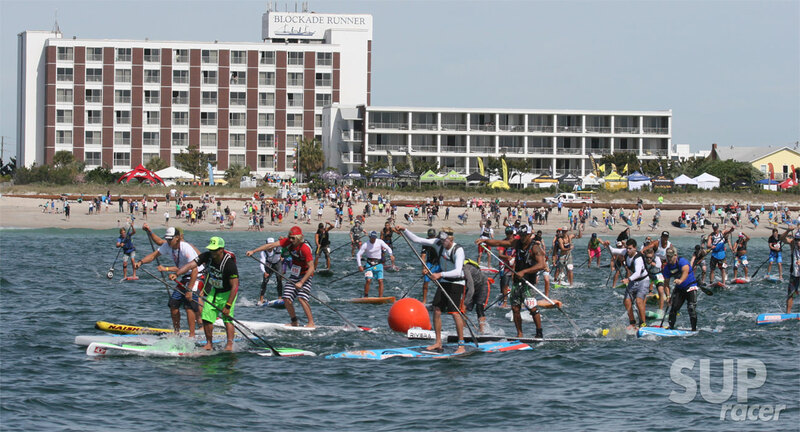 So the 175 paddlers who took to the 13 mile Elite Graveyard Race lined up on the ocean side of the event site at 10:15am Saturday morning. Once the horn blew, Slater Trout took off like a rocket and hit the turning buoy (which was a 200-300 metres off the beach) in first place. After that we had a one mile semi-downwind run to the harbour entrance. As the group rounded the rock wall, Connor, Travis, Danny, Georges and Jamie were in a group of their own. From my vantage point it looked like those five would be in a race of their own, but then Chase Kosterlitz managed to single-handedly close the gap and bring six other guys along with him… That made for a 12-man draft train that would stay together all the way through the inter-coastal waterway (all 8 miles of it). However once the guys hit the ocean at the top end of the Carolina Cup course, where there were still bumps to be found despite the wind dropping, the train exploded and everyone went in a different direction. It was here that the fittest and strongest stood up. Georges took a smart line and was leading for a few minutes, before Danny overhauled him. Travis was right there and if the wind had have stuck around might have been able to go one or two spots better. Chase Kosterlitz is an absolute workhorse and thoroughly deserved his 4th place – the pics below show he was actually in first as they went out through the waves at the mouth of the inlet. Jamie Mitchell returned to form, showing that he must have a very impressive base to work from – only three weeks back in training but still able to hold it together when it mattered most. Connor was still sitting top five right up until the 11/12 mile mark but eventually just hit the wall. Hard. Dropped all the way out of the Top 10. One month on the road and an unfamiliar race format had taken its toll on the young superstar. Matt Becker was extremely impressive in sixth, while Team USA comrades Chuck Glynn and Slater Trout were solid but didn’t have the legs (or perhaps arms) in the final stretch. Great efforts from the young Aussie duo of Lincoln Dews and Toby Cracknell, who went out hard and came home good enough for respective Top 10 finishes. In the women’s race, Annabel Anderson went out quick and was literally in a race of her own for the first 10 miles (there was no guys/girls drafting in this race). 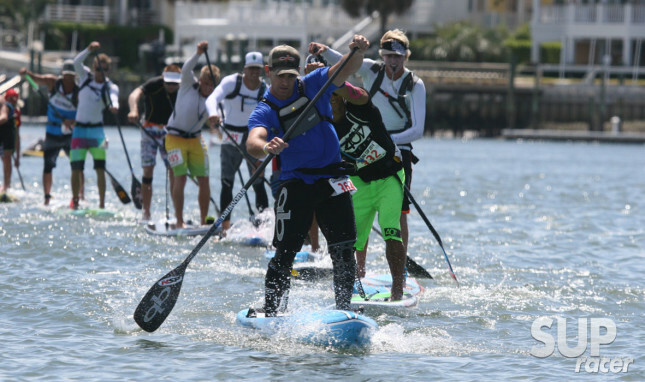 Jenny Kalmbach and Lina Augaitis worked together in the flats but were still a minute behind by the time they hit the ocean for the final three mile “sprint” to the finish. They stuck it out though and almost closed the gap, hitting the finish line just seconds after Annabel. Made for an exciting finish that’s for sure. Grueling race. Horribly-timed tides meant the current was pushing against us the whole way up the inter-coastal, before the final three mile ocean leg saw light cross winds that didn’t make it much easier. A lot of us were hanging on during the flats just waiting for the final downwind leg, only to discover once we exited the inlet that, to our horror, the wind had died and the final leg was a total mission. 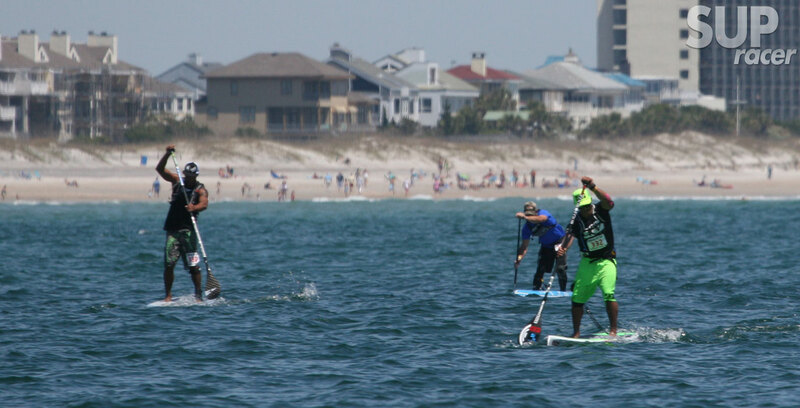 The Carolina Cup is the hardest race I’ve ever done and I think most paddlers would agree. At the end of the 13 miles most of the locals agreed it was the hardest year yet. Danny’s time was 10 minutes slower than last year. It was brutal. Actually I’m still trying to figure out why this race was so hard… 13 miles isn’t *that* far but almost everyone crossed the line totally spent. Great challenge. Great event. 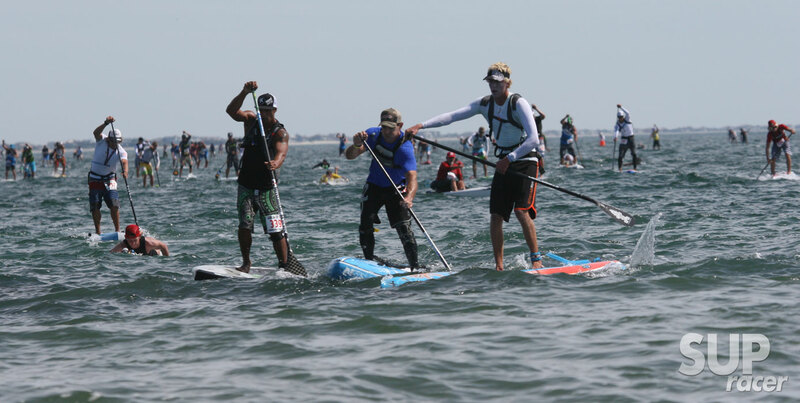 Approximately 600 paddlers raced today (with around 500 of those on stand ups). Massive. Also check out the massive photo gallery. We had a photographer on the boat taking some very cool pics. Annabel Anderson about metres from the finish. That’s Jenny and Lina right behind her. 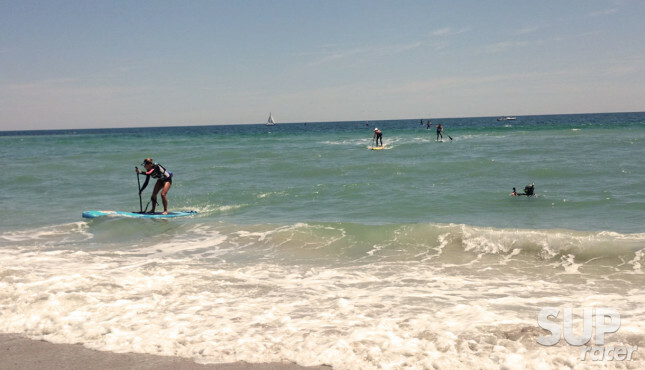 Click here for the raw results (including prone, outrigger and surfski divisions).